With numerous buttons and options you may never use, Gmail's rich interface can get in the way of actually reading email. To be fair, Google packs a lot of functionality into the interface, but no interface is perfect for 100% of its users. Gmelius is a simple Chrome extension and/or Firefox add-on that lets you pick and choose which features you want to see, and how you want to use them. 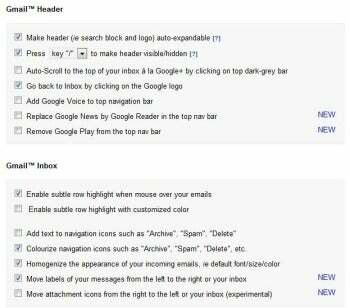 Gmelius for Google Chrome lets you decide which Gmail options you want to see. Gmelius's interface is just a long list of settings with checkboxes, but it's divided into sensible sections and gets the job done. With one click, you can hide Gmail's top bar, and toggle it back by tapping the slash key (/) when you're in Gmail. Another click moves the labels to the right side of the email line, and yet another adds icons to email threads showing the type of attachments they contains. Gmelius also lets you remove ads from Gmail, and homogenize the formatting of all incoming emails so that even if someone were to write you an email entirely in Comic Sans, it would show up in Gmail's default font. Note: The Download button takes you to the vendor's site, where you can download install the latest version of the software directly into your Google Chrome or Mozilla Firefox browser.